The only pace you should run is slow and easy. Unless you have a goal race in January, you may want to bag any notions of regular speedwork during winter. In clear conditions, sure, go ahead and give those hard reps and tempo runs a shot in the outdoors. Otherwise, you’ll want to do that work indoors on a treadmill or indoor track. If you’re going to venture outside and it’s at all wet, icy or snowy, the only pace you want to run is very easy. With conditions slippery, traction will be very erratic throughout your run. And like trail running, running through slosh and snow is more challenging in itself. Even when traction is better, it’ll often be on grass or snow, which again is more challenging. These are great runner’s strength and aerobic conditioning runs, more so than speed runs. Take it easy on the pace. The run itself will be challenging enough. Unless it’s your long run, all these runs should be shorter on mileage than usual. Go ahead and extend yourself on long runs. But for other runs, you should avoid the higher end of your mileage capabilities. If you are capable of weekday 8-10 milers in warmer months, perhaps stick to 6-7 miles for now. If after a while of running in these conditions your hypothetical 6-7 milers get easy, and you’re finishing them within an hour, then go ahead and tack on some extra mileage in future runs. But otherwise, the goal of the workout should be to get your work in and finish in one piece. If adamant about adding mileage, add short easy 2nd runs elsewhere in the day rather than adding mileage to your current runs. During a tough winter, you’re best off keeping your regular runs the same distance and intensity, but then adding a cheap 2nd run of 15-30 minutes elsewhere in the day, if you need to increase mileage. These 2nd runs require far less logistical work to get in, especially if you’d rather do them indoors on a treadmill. As long as these 2nd runs are not sprints, they should also aid in recovery between workouts by stimulating circulation and positive workout-related hormonal production. Make sure to wear waterproof running shoes when it’s wet or snowy outside. While your training doesn’t need to hibernate, your lightweight minimalist trainers probably do. Along with providing trivially little insulation against freezing cold, most shoe models lack foot protection from water. Step in any amount of water and your feet will get wet, which can be hazardous in a frostbite way at suitably low temperatures. If ground conditions are clear, those trainers may be okay as long as your feet are suitably layered (I throw on a 2nd pair of socks once the temperature falls below 20 degrees Fahrenheit). I still run quite a bit in my regular trainers, provided no snow or rain is in the forecast and the pathways are clear. However, if ANY precipitation is forecast, you best err on the side of caution with some waterproof footwear. And be warned that trail shoes aren’t necessarily waterproof. Many models are not. Research your brands of choice to verify if they are designed to resist and filter water or not. During my 1st Chicago winter of training I even went as far as to wear boot-style New Balance MW1400’s on training runs. They were very heavy (over 15 oz!) and challenging to run in, but no water, snow or ice of any kind got onto my feet. Plus their tread was welcome while sloshing through tough, snowy/icy conditions. You need not go that far in waterproofing your feet. Models such as Saucony’s GTX shoes and the Topo Athletic Hydroventures are designed with waterproof tech. Add in some running gaiters, and you should be good to go. Basically all of your running is equivalent to technical trail running. Your footwear and effort should reflect this. One reason your standard trainers are no-go in icy conditions is their limited tread. Much like running on trails, you need soles that can dig through uneven conditions and allow you to maintain friction on contact with the ground. You will already do enough slipping around in snow and ice, so you don’t want to further enable that with relatively flat soles. While I mentioned that not all trail shoes are suitably for icy running, trail shoes in general are typically the way to go once the ground is covered in snow and ice. They have thick, jawy tread on the soles for digging through dirt. They will help provide traction and keep you moving as your slough through snow and ice. Also, trail running demands a lot of work from lower body and core muscles that don’t necessarily work during typical runner’s training. 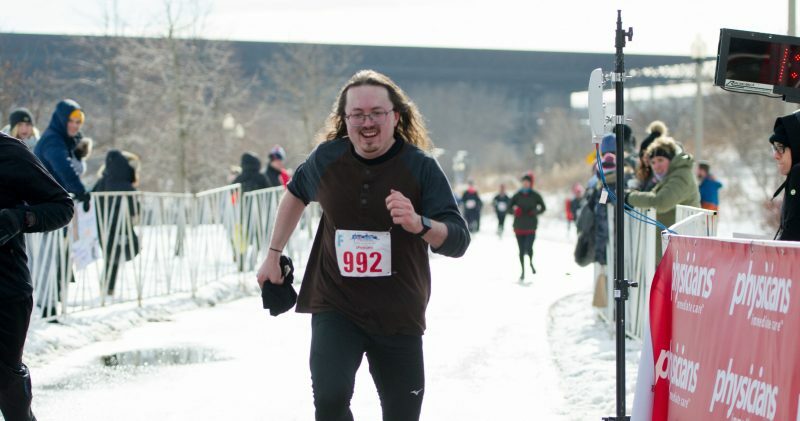 You often will find yourself unusually sore or tired after snow and ice runs. Infrequently used muscles are getting a workout, so you will want to take it easy on pace, distance and effort, and let those muscles get used to working. You’re going to need them a lot this winter! Pick spots to run on that are dry, all solid shallow snow, or on grass. You want traction with every step, and you’re not going to be able to run in straight vectors as you do in clear conditions. You always want to step on parts of the pathway that are dry, covered in grass, nothing but loose pillowed snow… basically, anything that will give your foot traction rather than wet conditions. If the desired path offers none of this and lots of ice, water or wet snow… pick another path or get inside and find a treadmill. All of your steps must be short and careful. I cannot bring up navigating snow or ice around my mother without her mentioning the danger of black ice, which is basically any ice on concrete that cannot be immediately seen by the naked eye. I can’t blame her: If you’re not careful, you often won’t know you’re approaching a patch of ice until you’re right on top of it, by which time it’s too late and you’re in trouble. As a runner, you’re not going to be able to avoid all the ice along your path, and so you need to safeguard yourself against the possibility that your next step will find a surprise patch of Shira’s favorite glass. Traditionally longer, striding runner’s steps leave you too far out of balance to recover should your forward foot find some ice and slip. Barring above-average proprioceptive balance on your part, you will likely spill and get hurt, or to a lesser extent hyper-extend a part of your body trying to correct course and injure that. Or, to a greater extent, if near a road, you could slip onto the road and into the path of a vehicle that almost certainly will injure you badly! One reason I generally advocate for shorter, lighter, quicker running steps is because those steps better keep you in full control of your body. That extra control becomes more important once you’re in icy conditions, where a single step can send you slipping to disaster. While one can argue more steps can lead to more opportunities to slip, I say it’s more substantially countered by the increased locus of balance and an increased ability to stay balanced and in control should you slip. Look 5-6 steps ahead and plan your next few steps. As much as I endorse living in the moment, you will want to practice some forward critical thinking while running in icy conditions. Runners are generally taught to look several seconds ahead while running, but this becomes critically important when running in snow and ice. You want to know what the road ahead looks like, what dangers are ahead, and what exactly you’re going to do to navigate the forthcoming situation. Almost like dance steps or a football coach drawing up a play, you want to know exactly where your feet need to go to safely get through the next several seconds. If you see a giant puddle or sheet of ice, you want to survey the area and figure out exactly where you intend to run to get around it, what options you have what alternates there may be in case your desired path has unexpected problems, etc. There’s a bit of chess to running in these conditions. Don’t get checkmated early because you didn’t realize that patch of wet ice was a patch of wet ice until you stepped on it. Dirt and grass paths and parks are best for winter running. If at all possible, try to do your winter running on grass, in parks, or city trails. Whether or not these are cleared by the government, they are much less likely to be covered in a sheet of icy glass. And even if there happen to be puddles or piles of water or snow, there’s a lot more room to safely navigate around them. Even if not clear, the snow on these fields and trails is easier to run through, plus beneath it is grass and dirt that provides better traction than icy concrete. You stand much less of a chance of slipping and falling in these conditions. It’s understandable if you don’t have a big park or a long dirt trail on which to do your running, or you need more than a block-wide local park to get your 4-6 mile run in (please don’t think you need to take 50 laps around the slides at your local park because I said so). If you must use the sidewalks then go for it. It’s just that if you have the option and it provides a good opportunity, use your parks and trails. If reasonable, try to scout your running path in advance. If you do plan to run on concrete, if at all possible, walk the path you intend to run in advance, to survey the conditions. This way you can find icy, slushy or puddled spots in advance so you know in advance to detour around them, whether that detour is just running along the edge of the sidewalk, or taking another street entirely. Better to spend time scouting the path in advance than to be surprised during a run with some dangerously bad conditions! If you slip and are falling, protect your head. Ideally, you’ll never fall. But I’ve slipped on ice and fallen myself enough times, on walks and runs, to know it will happen to everyone. If falling backward, tuck your head forward. The one thing you do NOT want is to smack your head against the ground. That’s basically the source of most ice-fall-related deaths or long term injuries. If you fall back, by bringing your head forward you lessen the possibility that it will strike the icy ground on impact, and that if it does the impact will lack momentum and be hopefully light. Likewise, if falling forward, hold your arms between your face and the ground. Try to land your head against your wrists. If anything other than your head contacts the ice first, it’s much less likely your head will hit hard. Something else on your body may get hurt, but that typically can heal. Brain damage won’t. Your number one priority if you do slip and fall: Protect your head. If you fall, always take a second after landing to assess your situation before attempting to get up. If surrounded by ice, seek to pull yourself towards the nearest patch of dry land or a hand-hold. Otherwise, just find a dry, quiet spot to stop and take stock. Ask yourself what day it is, where you are, etc. State clear answers aloud. Go ahead and risk looking like an idiot doing this. You want to make sure you can think and talk clearly. Make sure you can see and focus on objects as clearly as usual. Hold fingers in front of your face, move them back and forth and follow them with your eyes. We’re all adults, and you’ll typically know by this point if something is wrong with your brain, or anything else on your body. If in doubt, get to shelter and see a clinic or doctor anyway. Otherwise, you’re welcome to resume running if you feel comfortable doing so. Pretty much every time I’ve slipped and fallen I’ve been able to keep going without issue (knock on wood). If you approach an area that appears to be all ice or water, turn around or detour. I know you need to get in your 5 miles, or this is your route, damn it. But don’t be a hero. If the only way forward is covered in danger, just turn around or head another way. Yes, even cut the run short if you must. A safe 3 miles is better than an injury after 3 miles because you were trying to do 5 miles you were never going to be able to run today. Hopefully, at least some of this information will help you run safely in winter’s icy conditions. Maybe your winter will be mild and none of this will be necessary. One can only hope! But if you’ve got running to do, don’t let snow and ice stop you, and don’t feel doomed to the treadmill. I safely run these conditions every winter, and so can you.